I’ve been busy lately due to project I have been working on and I wanted to point your attention now to a new blog I’ll be running. This one might suffer under this one, so forgive if the posts come in slow. The webcomic is called Death’s End and is run by myself and Katie Rodriguez, a talented artist from the United States. To me the very core of a great story lies in the ending. Whether the entire story is put in an entirely different perspective like “Life of Pi” or we are reminded of what the story is about like “The Great Gatsby“, a good story is completely pointless without a good ending. A lot of the advice writers give is to take some time during writing to know where you are going with the story. A story is about something. Gatsby ‘s story is one about trying to rebuild the past and fixing old mistakes, something Jay is reminded of is not possible. “The Lord of the Rings” it’s not about defending the world from evil, the personal conflict lies closer to home, our hero’s conflict lies closer to home. In the end he is fighting for his home, the Shire. Returning home to that place and discover that this final bastion of good, purity and innocence has been corrupted by Saruman adds a rather poignant, but bitter note to the story. While the theatrical version of the story left this out of the story, I believe it added a sort of reminder that their fight will never end. What I want to ramble about is the fact that two shows I adore are ending. Dexter, is an adaptation of Jeff Lindsay’s novels, but as the show has long since abandoned following those books, I think it is worth treating the show as something existing on its own. I’m busy writing, working, making life work out. Forgive me for ignoring this blog. 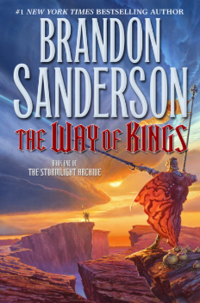 This morning I finally finished the Way of Kings, by Brandon Sanderson. What can I say? I couldn’t resist making a quick review. It’s good, but that would do it injustice, so here’s why it is great. Genuinly, Sanderson’s a master-worldbuilder, it is obvious from his lectures that can be seen on Writing about Dragons. If anyone has not seen these lectures they should, and once they have, read this novel; At a 1000 pages it is gargantuan and very ambitious for a series opener, but it convinces. We see the world through the eyes of several figures, most notable Kaladin, a once hero whose famed luck has turned on him and brought him to slavery and the horrible shattered plains. This is the first time we truly see what Sanderson is capable of, by really delving into the mind of the slave of Bridge Four. We see the consequences of the hubris as men through the eyes of those who suffer the most. It is a world where people are judged on the colour of their eyes. And where magic is connected to the very nature of the world, one tormented by fierce storms. Kaladin, a once hero who is now faced with a lifetime filled with death and cruel slavery at the Shattered Plains. Dalinar Kholin, a High Prince filled with guilt over the death of his brother. A man living a life filled with codes and rules. Adolin Kholin, the son of Dalinar, a boy who wishes to see his father return to a former glory, but instead fears to see him fall victim to madness. Szeth, a dutiful assassin and killer of kings. Shallan Davar, a young woman seeking apprenticeship with the former King’s sister. She has some ulterior motives. The book is filled with many characters and it would be a scandal to derive you from the chance of getting to know them. Though I must warn people, this books is heavy reading, the learning curve is quite steep and a lot is thrown at you. Yet it hooked me at the first page, and on a flight back from Canada I read 300 pages. Get the short-story Sofia for free on Amazon today. Sofia is lonely. Humans have left many years ago. What do you call a year without a sun? And what is being lonely. So many questions and no one to ask. She remembers everything, the best machine ever to have been built by humans. When they finally return she will help. She is programmed to help. Click here to go buy it. Good intentions tend to turn sour if you don’t commit to them. Take this blog for instance. Once I had told myself to commit to posting here at least once a weak. Once upon a time. It felt like such a reasonable idea, but then other things happen. Stuff always happens and distracts you from the things you want to do. My other good intention was to write daily. I didn’t know if I was going to be able to keep it up, but considering my goals, I had no choice but to do so. I am planning to release a full sized novel by september. And darn it! I’m committing to it. It’s like every month is NaNoWriMo and maybe that’s how it should be. The idea that you should write every day for one month is a good one. Because if you do, you’ll realize that many small ones make a big. A novel is around 75 000 words. Mine will probably be a bit bigger. That number sounds huge, but I can tell you that every writer worth his name, can commit to writing a 1000 words per day. 75 days equals approximatily two and a half months; It is not impossible to write a novel in two and a half months. I’m not counting editing and cleaning it up so it is publisheable. But a first draft: should be very possible. So that’s what I have been doing for the past few weeks. I’ve been trying and struggling to write daily. There have been days where I couldn’t even get beyond 200 and there are other days where I ended up zooming through the first 1000 in 30 minute and ended up writing 7000 that day. My amounts are thus very uneven and I think part of the reason is that my writing is equallly uneven. There are parts that are as clear as day in my stories and there are bits and pieces of the novel that still need to have their details defined. I end up spending way more time defining those details than I do actually writing. Then there are times where I can’t even bother to write this scene and end up skipping it. This is advice I think every writer needs to know and it is so face-smacking obvious that I probably seem like a fool to only have recently figured it out. If a scene is boring to write, it is boring to read. So the problem isn’t always your state of mind, but the state of the scene. If you zoom through writing exciting scenes, make sure all of them are exciting. I started by redefining the way I wrote chapters Usually I found myself writing scenes that only had as a purpose to set up a scene at a later point. And more often than not there were entire chapters like that. So I started to look at every chapter like I would to a short story. I made sure that the characters in this chapter actually go through something signficant by the end of it. This had two results: the first one is that all my chapters became a hell-of-a-lot longer. I didn’t think that was anything to cry about. The second result was that they actually were better storywise as well. See to me a chapter has to be important enough to exist. There has to be a plot happening. If you leave a character the same way you join him at the start of a chapter, don’t bother writing that chapter. Characters are in a constant state of change. The location they are in can change, their physical state, but mostly their emotions change. How they look at things. I wrote an entire chapter yesterday about a character staying in the same place and very little things changing, but this character went from being hopeless to hopeful and that’s a journey, that’s plot. I think I’ve become a better writer in the last few months. I hope I am. It’s frightening not to know whether or not you are good until you actually show it to people and get reviews. But I’m too far into it now not to keep going. I will finish this, I will reach my goal. So, keep your eyes open for a large novel coming up. When life happens you tend to forget things. In my case it was this blog. As far as the list of important things went, keeping this one updated daily wasn’t high on the list. I hope this is something that can be forgiven. Currently I will try and be a little more active, but I’m terribly busy. I’ve recently started writing on a full-sized novel. On this blog I have mostly blogged about my love for shortfiction, a quick start and finish without too many hassle. I do love the idea of a big novel, and that’s where I’m working towards now. The progress is pretty slow, I am currently finishing the outline before getting started. I can tell you it is ambitious, maybe even slightly too much. I won’t be writing short stories for the next few months, for exactly that reason. Now onto my next project. The best description would be epic fantasy. It’s very influenced by Wheel of Time, Way of Kings, Game of Thrones and Lord of the Rings. This story is written with the help of self-published author Sara King. She is one of the cofounders of Parasite Publications, the group of people that will support me from brainstorm to sales. My books will still be selfpublished, but now under the Parasite name. As I’ll be writing a lot these next few months, trying to finish my first novel before the summer’s deadline, I will have to rid myself of some other distractions. This includes blogging. Because of this I will limit myself to one blogpost per week. Today was the release of Lawna Mackie’s fantasy novel “Perfect Misfits”. I am pleased to share this story with you, as well an exclusive excerpt from the book in the “READ MORE” section. Yes, I’m tossing about confetti. Not because I’m throwing some extravagant halloweenparty (though I might actually do that later). I just received great news. So short story very short. A few weeks ago I got wind of a publisher willing to publish my genre of books. Today I learned said publisher is willing to work with me on improving my writing until it has reached the level of quality expected. In short, I wasn’t good enough. I am however not bad enough to throw away. I’ll be working on my writing starting around january with hopefully results not much later. Also to those participating: good luck with NaNoWriMo! Blogging is hard. It’s hard because it makes you completely aware of when you aren’t doing as promised. I planned on making daily posts. Needless to say I failed. It’s not because I’m lazy. I am lazy, but it is not the cause. In fact I usually blog when I’m too lazy to write. When I write I make little time for other things. I should’ve known this would happen on this blog. So where does this sudden boost of writing come from? It’s because I’m anxious and excited. A few days ago I heard through the grapevine about a publisher interested in the genre I wrote. A friend of mine, Kal S Davian, was recently signed on with them as a writer. Since what I write is in the same vein, yet completely different, I wanted to convince this publisher I am a valuable talent. That very day I started writing on a story tailored for their requirements. I had played around with the story idea for the days before and I believed it was one of my better stories. So that very afternoon I started writing. From noon ’till midnight I wrote non-stop until I finally got to the end. 12 000 words in 12 hours, I’ve never written so much in so little time. After days of editing and proofreading I finally sent it in for review yesterday. So I’m currently sitting here rethinking every error that still remains in the manuscript, cursing myself for things I forgot to say in my motivation and also checking my e-mails way too many times. I will keep you updated on how things go. The reviewers take about 1 – 4 weeks to respond, but in the case of Kal they only needed 2 days. If I get a negative expect the story to be published here. If I get a positive I will keep publishing here but now with the guidance of editors and mentor-ship of more experienced authors. Branding of a Heretic is the first short story in the “Nihilian Effects” series. It is an epic fantasy written by my good friend Kal S. Davian. You can get it for for free today on Amazon. Claradina is a calm and collected historical scholar, that is until she stumbles upon information in a recently uncovered document that could change the world forever. With the collective Mind standing in her way, she must gain allies and bend the rules if she is ever going to expose the truth behind the history. Lu’vina was referring to the Purge of Lies, a period of time a century ago in which many new documents were found. Each contained contradicting facts about the followers of the light, painting the dark races as righteous and their acts in history justified. But the documents were quickly falsified by the Mind–a council of scholars that made major decisions for the religions views and histories–and this led to nationwide burning of any document said to have even the slightest mention of the dark portrayed in a lighter fashion. Lu’vina was quiet. When Claradina looked up, she realize her clerk was not being thoughtful, she was stunned. “M-my lady, are you sure this is a wise decision?” Lu’vina finally stuttered. “If the Mind views this wrongly, you could be tried and killed as a traitor! I suggest we examine it further before coming to any rash conclusions.” She sounded close to terrified.